Buying the house and turning it into a home that we both could love was a serious challenge. We couldn’t simply say: “It’s all good.” No, we had to pick one house and one color, or at least on color for each room. Although men are more likely to be color blind, I know for a fact that I am not. However, compared to Jeff I might as well be. Confronted with a dozen different shades of yellow, he will likely freeze when confronted with the horrifying consequences of picking the wrong one. I on the other hand, in very good lighting and holding them next to each other, am hard pressed to tell them apart. I clearly remember the expression on Jeff’s face when he proudly presented me his color choice for our new office. It was some shade of light blue. Since light blue is the only color I have never warmed up to – I once repainted an entire room only a few days after I thought I had gotten over my dislike – I rather undiplomatically blurted out: “I don’t think so.” I was stunned by the hopelessness that suddenly bowed down the shoulders of the love of my life and my suggestion to “just pick another one” was only met with a sigh of despair. Days later, I did come to appreciate that Jeff had presented me not with a simple color choice, but with the solution to an almost impossible to solve puzzle. Here is the challenge. If you stand in just the right spot in our kitchen, you can see the backsplash behind the stove, the dining room, a sliver of the hallway and in the distance the office. Since each of these rooms is painted a different color, they all have to harmonize to form a “Gesamtkunstwerk” as we Germans would say. They all have to work together as a whole. 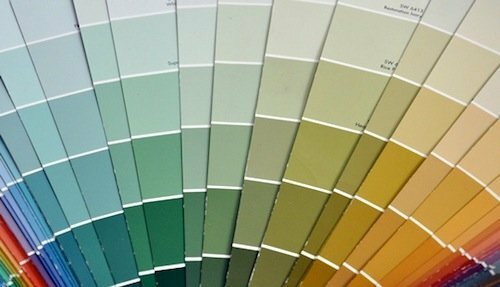 Laboring to find just the right combination of colors was the price Jeff was willing to pay for not painting everything realtor-white. The overall impression is really lovely, but by rejecting one of the puzzle pieces I had thrown over the entire arrangement that Jeff had worked on for weeks. My darling did recover from the episode and came up with another choice that was not blue, as impossible that had looked at first. Today, when I mention that our home reminds me of Pipi Longstocking’s house Villa Villekulla, the house of many colors in German, he even takes that in mostly good humor. I should mention that I have very fond memories of Pipi, even if I have no intentions of keeping a monkey and our place is definitely too small for a horse. How did we end up here? My parents never moved from the house my dad built together with his father. But within this stability there was always room for change. My dad ran a business as a contractor, painting houses and hanging wallpaper. In the early years business was slow during winter and he had plenty of time to redecorate or try out a new technique at home. My mother loved moving furniture and I came home from school several times with the living room furniture half way to the den and vice versa. I soon learned that, if I didn’t like a color today, there was always a chance to redo it. On the other hand, Jeff’s parents divorced when he was ten and he moved six times before graduating high school, and seven more times in the following nine years. So it is not surprising that he finds comfort in rituals and patterns. Today we are figuring out how to grow together, try out new things and sometimes change our minds. That’s why we are getting rid of the electric yellow and making room for the creamy camel – a deliciously edible shade that miraculously works with the rest of the rooms and this time around we even picked the new color together. As they say, change is hard and sometimes it takes a second coat. This article was first published at Frontiers LA. Rolf Danner. RSS feed. Blog at WordPress.com.